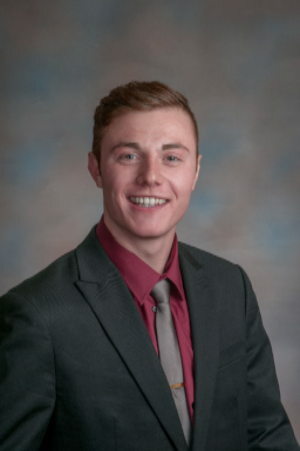 CARMEL, IN - Theta Chi Fraternity is proud to announce Derek Joseph Hatzenbuhler of Phi Chapter at North Dakota State University has been selected as the recipient of the 2017 Reginald E.F. Colley Award. The award is Theta Chi’s most prestigious collegiate honor and annually recognizes distinguished service to alma mater, fraternity and community. Derek joined the Phi Chapter during the fall 2015 semester and took an immediate interest in leadership, which included being nominated to serve as Secretary for the chapter in 2016. During his pledge process, he was recognized by the Phi Chapter as the New Member MVP and became a donor to the Centennial Club, in support of the chapter’s house renovations. On campus, Hatzenbuhler became involved with the North Dakota State University Student Government serving as a senator, and as a member of the Civic Engagement and Memorial Union Gallery Art Boards. Since joining student government he has twice been recognized as Member of the Week. He has been a member of the Photography Club, Public Relations Student Society of America, and the Bison Information Network. During the spring 2017 semester, Brother Hatzenbuhler laid the foundation for the eventual creation of the Strategic Communication Research Association (SCRA) at NDSU with the help of his research professor. As a member of the Advertising Club, he participated in the National Student Advertising Competition on the presentation team and served as the club’s Art Director. This upcoming fall semester, he will be serving as a Welcome Week Leader for a second time. Within the Fargo community, Derek has extended the assisting hand in many ways. He has been a volunteer for the Special Olympics, WishFast (a local chapter of the Make-A-Wish foundation), participated in NDSU’s dance marathon, and contributed to the school’s day of service held annually on Martin Luther King Jr. Day. He has also partaken in Phi Chapter’s Days of Giving, which has included volunteering for the Charism Food Pantry and at the New Life Center, which helps the homeless community with transitioning into the workforce. Derek has been a significant contributor to the NDSU Greek Life community as well. He twice attended the North Dakota State University Greek Leadership Conference, which covers topics such as Parliamentary Procedure, qualities of a leader, and ways to encourage discussion about tough topics. Derek is also an experienced photographer. He had photography series featured on campus such as in the Flakoll Gallery (spring 2016), the Memorial Union Gallery (fall 2015, fall 2016), and in the Memorial Union (fall 2016). Some of his work was installed in Barry Hall, a building of the College of Business, and he was featured in a “Meet the Artist” video, which was created by the director of the Memorial Union Gallery. During his time as a member of the Phi Chapter he attended and helped organize numerous chapter retreats, executive board retreats, alumni banquets, and chapter recruitment seminars. He attended Theta Chi University in the spring of 2016 (Drake University) and the spring of 2017 (University of Minnesota). This past January he attended Sasser Presidents Conference in Carmel, IN upon being nominated as chapter president. For the 2015/2016 school year he received a Sherwood and Janet Roberts Blue Memorial Scholarship from The Foundation Chapter, and will be receiving one again for the 2017/2018 school year. He is also a member of the Deranian Soceity, which recognizes Chapter Presidents who commit to a monthly gift of $18.56 in support of the Sasser Presidents Conference upon graduation. Among his long list of accomplishments, what may be most impressive is what he did in the classroom. During his time at NDSU, he has maintained a grade point average of 4.0 (on a 4.0 scale), which has placed him on the Dean’s List for every semester of his college career. Due to his scholastic accomplishments he was selected to become a member of the Order of Omega Honor Society, and the Phi Kappa Phi Honor Society, which requires a grade point average within the top 7.5% of one’s class to receive an invitation. “Each time I have ever called Derek about something, whether it was to investigate housing for visiting brothers or to coordinate details surrounding a specific event, he has always been timely and professional,” stated 2011 Colley Award Recipient Cory Loveless (Phi/North Dakota State 2011). “From my interactions with his peers, they all have great respect for Derek and the work he does for Theta Chi”. Phi Chapter now boasts five total Colley Award recipients. Previous recipients include Roman E. Meyers (1934), Major General Larry F. Tanberg (1941), past Field Executive Cory C. Loveless (2011), and Kyle E. Sebesta (2013). Along with this, he is receiving an award named after a fellow Phi Chapter brother, Reginald E.F. Colley (1915). Derek will finish his degree this fall and will receive his Bachelors of Science in Strategic Communication, with focuses in Public Relations and Advertising, and a minor in Art. First presented in 1929, the Colley Award is named for Reginald E.F. Colley, a World War I veteran and past member of Theta Chi’s board of directors, the Grand Chapter. As a member of Phi Chapter, Brother Colley developed a celebrated reputation as a campus, community and civic leader. He graduated in 1915 and eventually headed overseas to fight for the U.S. Army on the Western Front. Brother Colley died at the age of 39, but his legacy of leadership continues to inspire future generations of talented Theta Chis. Today, the Colley Award is treasured as the Fraternity’s most prestigious collegiate honor. Founded in 1856, Theta Chi Fraternity is a men’s collegiate fraternity with more than 185,000 initiated members and has established 235 chapters. Leadership development, personal development, and service to alma mater are fundamental to Theta Chi Fraternity’s mission.